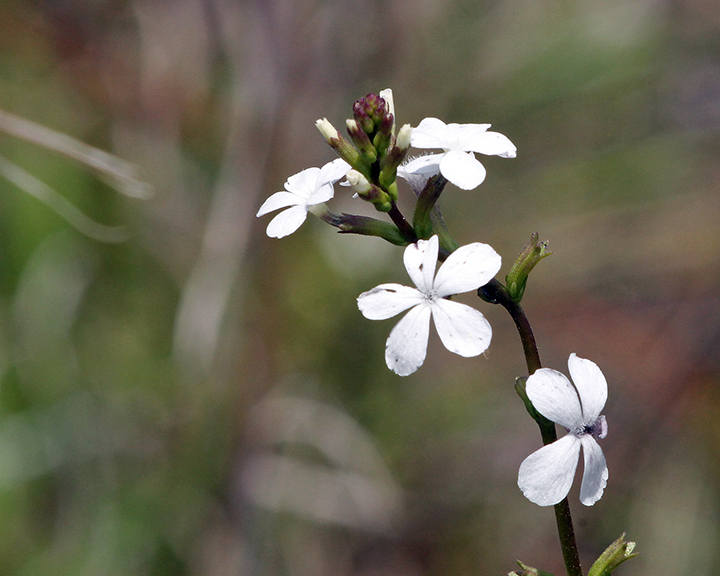 American bluehearts is a perennial wildflower found in pinelands, prairies and marshes, and along roadsides. It blooms year-round, with peak blooming in late spring through summer. It attracts many bees and butterflies, including the common buckeye, for which it is a larval host. Its seeds are eaten by birds. The flower varies in color from bright violet to almost white. It is comprised of a tubular corolla with five petal-like lobes. The entrance to the corolla is hairy, as is its exterior. The green-to-purple calyx and the delicate stem are also covered in trichomes. Narrow leaves are oppositely arranged and reduced in size as they ascend the stem. The fruit is an inconspicuous dark purple capsule. American bluehearts are hemiparisitic, meaning it can grow independently (without a host) but grows stronger with a host. It has parasitic roots that it attaches to its host’s root system. The parasitism is generally not harmful to the host, except during times of stress (such as a drought) when the plant will increase the parasitic effect, which may result in damage to the host. To see where natural populations of American bluehearts have been vouchered, visit florida.plantatlas.usf.edu. Garden tips: Although not widely cultivated, American bluehearts can be used in naturalistic landscapes and restorations. It is fast growing and moderately tolerant of drought conditions and nutrient-poor soils.